Rottenlead: MIG Pigments for weathering. MIG produce some nice washes, oils and pigments which you can use to add detail to models in 15mm and other scales. I think this is an Antenocitis Workshop trash / garbage bin in 28mm scale. I airbrushed it a basic yellow and then simply washed it with various GW inks. I then used some Turps in a small mixing pot (a drop or two) and then added the weathering power. Weathering powder is very fine power which unlike paint does not dissolve totally, so you can build up a texture. Once applied with turps or thinner you can then add a tiny drop or two of pigment fixer. It is an enamel based fixer which locks the pigment in place. In this example I am using the new Industrial pigment from MIG which dries to a much lighter colour than the dark area on the left of the garbage bins front. Trash bin with added MIG pigment on the front left. I have used pigments for a few years and you can see some in action on the top of these buildings. The circular buildings from Old Crow and the mech hanger beside the King Crab Battltech mech both have pigment washes blended on the tops. Pigments can be used like washes with a bit of thinners or turps and the result is a smooth well blended shade which is super matte and dusty looking and less harsh than an ink or GW type wash. I think the technique will work well in 15mm scale, especially on tanks and anything that needs weathering or mud adding. MIG also provide a thicker resin based pigment fixer which can be mixed in to create chunky mud finishes. I have never used it but will certainly try it on a tank track soon to create a fresh mud look. 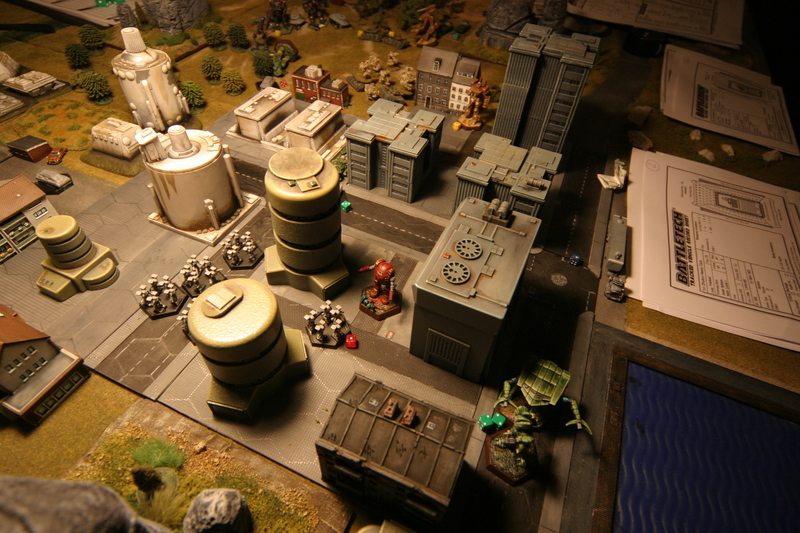 Terrain layout with MIG Pigments used on the tops of buildings. Looks great, but I might be being a little dense, what's turps? Turpentine? I've always stayed away from pigments since I wasn't sure how they could handle normal handling... I'll have to try this! Turnips were the solution to everything in Britain before they imported Tea. Things looking bleak? Have a tunip. Thanks for the weathering tips. I'm always keen to learn various techniques from other painters.